Haw king was born on January 8, 1942, in Oxford, England. He became interested in science and mathematics as a teenager and then attended Oxford University, where his peers and his professors noticed that he could handle very difficult problems with relative ease. In 1962 he graduated from Oxford University and in 1965 he received his doctorate in cosmology (the study of the universe as a harmonious system) from Cambridge University, where he continued on as a research fellow and later as a professor. Hawking’s doctoral work concerned the theory of black holes, originating with Karl Schwarzschild in 1916, which are thought to be cosmic bodies possessing such enormous gravity that nothing can escape from them. The center of a black hole is a space ­time singularity, a place or moment at which the principles of physics break down. In 1968, Hawking began working on theoretical problems of space­ time singularities, and in 1973 he co­authored with G. E R. Ellis the technical book The Large Scale Structure of Space­ Time. The book described the theory that the universe began with a space­ time singularity, and that this singularity corresponds to the Big Bang theory of the origin of the universe (proposed by Aleksandr Friedmann and Abbé Georges Lemaître in the 1920s and updated by George Gamow in the 1940s). In 1974, Hawking issued the surprising theoretical proof that in some circumstances, black holes can emit thermal radiation. 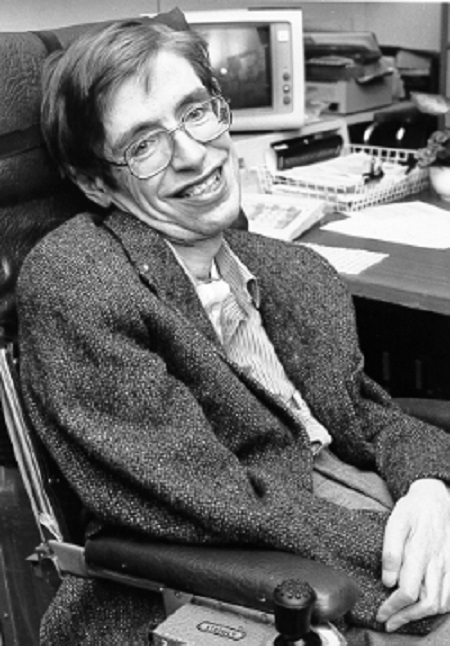 In the late 1970s, Hawking began to attempt to link the theory of relativity with quantum mechanics in the hope of producing a unified theory of all physical principles. In the 1980s, this work led him to propose that the universe has no boundaries in either space or time and therefore no beginning and no ending. In 1988, the publication of Hawking’s A Brief History of Time: From the Big Bang to Black Holes catapulted him into international stardom. The book was Hawking’s attempt to communicate his ideas to a general audience, and it remained on bestseller lists in the United States and Britain for several years. Hawking has received numerous honorary degrees and awards throughout his life, and the popular media have helped develop his reputation with articles and programs about his . Hawking has reshaped the field of theoretical physics with his rare insight and new theories. He has also distinguished himself by successfully communicating his work to the general public. Hawking’s ideas have been crucial to the development of modern cosmology and the current understanding of black holes. The Big Bang theory of the origin of the universe was put forth in 1933, but Hawking’s work in the 1970s concerning space­ time singularities represented the first strong mathematical evidence supporting the theory. Prior to the introduction of Hawking’s astounding black hole discoveries, many scientists thought it would be difficult, if not impossible, to learn anything concrete about the properties of black holes. The success of Hawking’s A Brief History of Time illustrated that the general public has great interest in the questions physicists attempt to address. Some scientists believed that most people are either too apathetic or uneducated to understand or engage in physical sciences. Hawking’s book proved them wrong. Hawking has attained a rare celebrity status among scientists. Despite suffering from an illness that confines him to a wheelchair and requires him to use a voice synthesizer to speak, he has pursued his work, taught, published, and spoken at many public functions. His have been an inspiration to many.